Orientalist (1783-1835). 5 autograph letters signed. Berlin und Paris. Zusammen 7½ SS. auf 8 Bll. 4to und gr.-8vo. To various addressees. - I: June 16, 1811. 4to. 1 p. on bifolium. 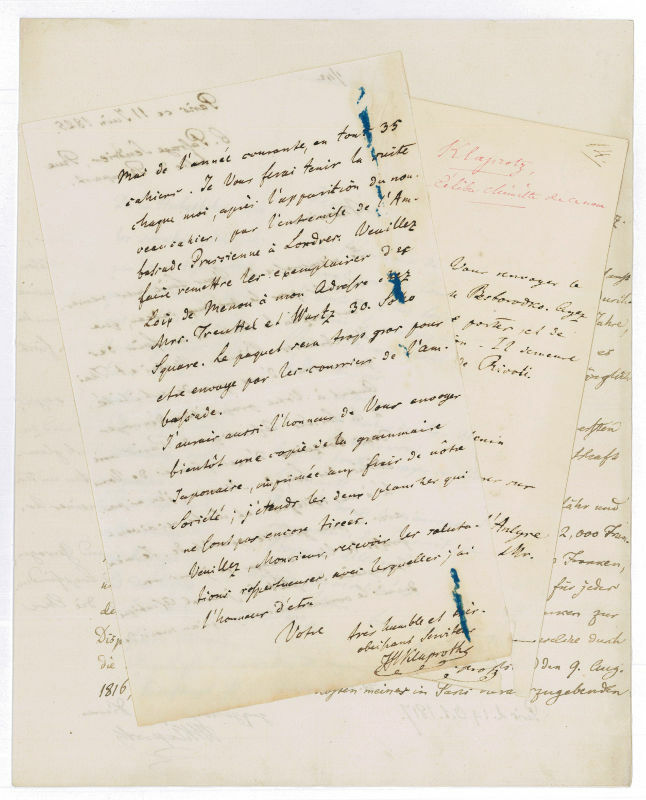 To the Institut Impérial at Paris, concerning the template of his writings on Asian literature. - II: October 19, 1817. 4to. 2 pp. on bifolium. Presumably to Count Karl von der Goltz, German ambassador at Paris, concerning benefits for printing his work in Paris. - III: October 29, 1824. 8vo. 1 p. on bifolium. With autogr. address. 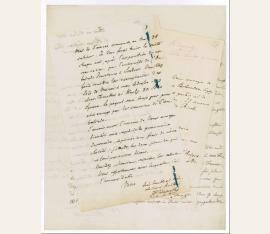 To bookseller Cassin in Paris, ordering some books, including Franz Bopp's "Conjugationssystem" (1816). Tear from breaking seal (small loss to text). - IV: June 11, 1825. 8vo. 2 pp. Probably to the Irish orientalist Sir Graves Champney Haughton (1789-1849), whose edition of the Manava-Dharmasastra ("Loix de Menou") is mentioned. Trances of mounting on reverse. - V: August 15, 1834. 4to. 1½pp. To one count, concerning a projected edition of Marco Polo. Somewhat wrinkled; upper edge slightly dusty and with collector's note "Great Chinese Scholar". - Klaproth was an orientalist or an "Asiatologist," in that he had a good command not only of Chinese, but also Manchu, Mongolian, Sanskrit, Turkish, Arabic, Persian, and even Caucasian languages. His wide range of interests encompassed the study of the development of individual countries in their Asian context, which contrast with the 21st century focus on specialization..